It's been a difficult start with three successive defeats, this coming as we started the season late after having a stop/start pre-season in Austria where all the games were called off. I saw the opening game against Tranmere and it could have gone either way, but we couldn't find a goal and it was the visitors who won it 1-0. That was followed by two more defeats and that damages confidence. That was evident in the early stages of the game today but once in front on 23 minutes it all changed and we looked a much better side that really could have gone on and won by more than two goals. That opening goal came from Tommy Wood. It's not quite his first Alliance goal for the club. 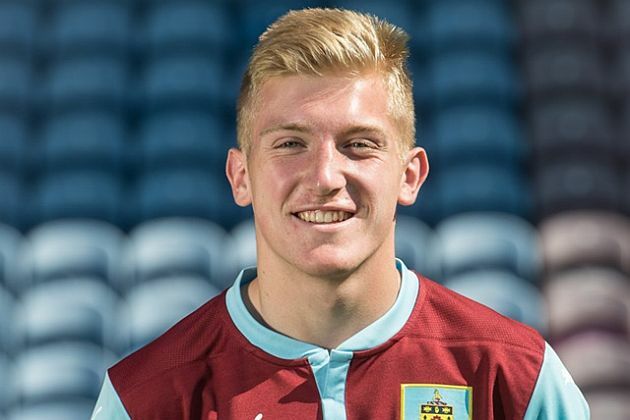 Last season he scored in a 2-0 win at Oldham while on trial but has now started his two year scholarship with the Clarets. It started when Andy Nugent (pictured) tried to find Jamal Crawford down the left. Nugent was in action for the first time since February when a back injury ruled him out for six months. He played the first half and looked as though he'd never been away. This time, he and Crawford were on the wrong wave length but they quickly combined to get the all back and Wood got in front of the defenders to direct Crawford's low cross into the net from close range. It knocked Rochdale and we were much the better side for the remainder of the first half and after the break we dominated for long spells until Rochdale gave it a go to try and get back into the game in the closing stages. We didn't have too long to wait for goal number two. It came in just the eighth minute of the second half when Josh Dolling headed a right wing cross towards goal. The Rochdale keeper got a hand to it and managed to tip it onto the post before it went into the net. Until that late flurry it really was all Burnley. Expertly marshalled at the back by Shaun Hobson, we moved the ball quickly and played some really entertaining football at times. This was far better than anything previously played this season and only some outstanding goalkeeping kept the score down to 2-0. But Burnley will be delighted with this. The first points are on the board, we've kept a clean sheet and we played some really good stuff. Our two strikers Wood and Dolling got the goals but probably the happiest of the lot is Nugent who came through the first half on his way back to full fitness. With Andy Farrell currently in charge, we are back home next week when Morecambe are our visitors. This game will again, I believe, be played at Burnley Belvedere with a 10:30 a.m. kick off. Today's team was: Tony Aghayere, Billy Grogan, Shaun Hobson, Lewis Norvock, Andy Nugent (Andreas Bianga ht), Olatunde Bayode (Tyler Shrimpton 84), Miles Fenton, Hamam El-Fitouri, Jamal Crawford, Josh Dolling (Nashé Chakwana 75), Tommy Wood. Subs not used: Connor King, Mark Howarth.